Help us Spread the Facebook Zombie Infection! 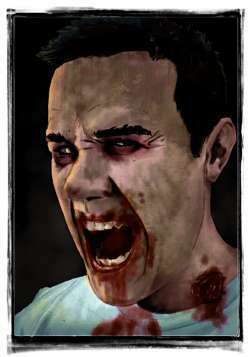 Want to learn how to paint a zombie Facebook profile pic? It’s time to get spooky with this lesson on how to use the free software, Gimp, to create your very own zombie profile image for Facebook. No drawing skills required for this one – you’ll just be tracing over a photo, so that you can get right into coloring. Don’t like Gimp? Well, then use Photoshop, Painter, or anything you like and just have fun with this! I used to recommend Paint.net, but when I tried to use it for this tutorial I quickly found out that I wouldn’t be able to get the kind of results I was looking for, and that’s when I turned to Gimp. The software works on both Mac and PC, so pretty much anyone can get into this one and get started. I found Gimp to be a great Photoshop alternative for anyone looking for a powerful drawing and painting software. This was my first painting done with Gimp and I was really impressed by how easy it was to get up and running quickly. However, there are some quirks to using it, and in the video I go over the biggest one, which is how to get your tablet to work when the software starts up! Halloween is just a few days away, and I’d love to see you create your very own Facebook Zombie profile picture – heck, it’ll even work on Google Plus, Deviant Art, or anywhere else on the web that requires a profile picture. This lesson was also heavily inspired by our users that don’t have Photoshop, as well as the great painting series created for Pencil Kings by Marvel comic book colorist Giovani Kososki. If you are interested in learning more about how to paint – he covers everything in his “How to Color a Pin Up Girl” video series. Looking for a lesson plan for Halloween? This would be an awesome lesson for any art teachers out there that are looking for a fun, creative Halloween themed idea that ties in with social media and builds real-world skills without needing to spend a cent on software. We’re really excited to see what people do with this lesson. Really just have fun with it and create whatever you’d like – cute zombies, cartoon zombies, realistic zombies – whatever you’d like – this lesson is all about you having fun with a new drawing tool, and if you do happen to have access to Photoshop, Painter or some other drawing software we’d still love to see what you come up with! Help us Spread the Zombie Profile Infection! We hope you enjoyed this article on how to create a zombie Facebook profile pic. Click the Like, Send or Plus buttons below and help us create a zombie epidemic on Facebook!